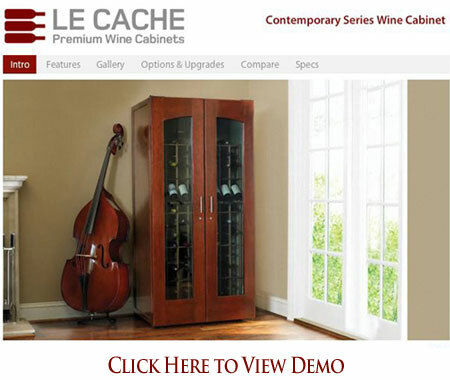 Le Cache Model 2400 Wine Cabinet Chocolate Cherry (P/N 735). Clean, contemporary design blends equally well with modern, Craftsman, Deco or Asian decors. Hardwood doors and gently arched windows showcase fine wine collections. Sealed seams, premium insulation and tinted double-paned glass provide thermal and UV protection.These options are included in the price of your wine cabinet. NOW EVEN QUIETER! The Model 2400 is our most popular size wine cabinet, with beautiful Venetian arch windows and storage capacity for 286 bottles. Just ordered the 2400 cabinet. Bruce and Ben were great during the pre-ordering process. All my questions were answered in a timely manner. What an absolutely beautiful piece of heirloom quality furniture! We were extremely please with every aspect of our purchase - with a special thank you to Ben for his amazing help and support. The quality of the unit cannot be overstated, simply the most beautiful and well made wine storage cabinet I've ever seen. Ordering was simple, easy and operator very helpful. Looking forward to receipt very soon. Cabinet is beautiful, but the cooling unit did not even last 2 years. The warranty requires the customer to pay for shipping and installation of replacement unit. Not what I expected from a $4000 wine cabinet. Suzanne, thank you for your feedback. We completely agree with you - the cooling unit should not have failed after just 2 years. It doesn't happen often, but when it does, you should not have to pay for the cost to replace the cooling unit. Our CS team will contact you to coordinate. We're really sorry for the inconvenience. I am so pleased not only with the design, but how quiet my unit is. Am glad I made the decision to purchase this fantastic product! I will definitely purchase another in the future! Customer service was excellent from the first phone call to installation! Pleased with the unit and our contacts with [the dealer] and Le Cache. We look forward to years of use. We purchased the Le Cache 2400 unit. The wine cabinet is beautiful. The cooling unit is quiet. We are very pleased with our purchase. Very pleased with the beauty of our wine cabinet. Waited longer than we hoped for delivery, but well worth the wait! I must say that the cabinet was worth the wait. It's great looking and certainly adds a great presence in my house. Thanks again. Our wine cabinet working well for us. It is a nice addition to our restaurant.